Kerala SSLC Results 2013 will be published on 24th April at 11.30 AM. Deputy director of Education Kerala M D Murali has told the press about the date of results declaration. Students who are waiting for Kerala SSLC results can visit the official websites after the results get published on 25th April 2013. In 2013 4, 79,650 students appeared for the exam. For the first time, the results are published much earlier with 50 centres under 3 zones finishing the tabulation process in record time. In 2012 the results were published on 28th April with 93.6% students getting chance for higher studies. According to the Indian system of education, the basics consist of five years of primary schooling to be followed by five years of secondary schooling. The Secondary School Leaving Certificate (commonly referred to as SSLC) is a certification which is given to a student for his/her successful completion of the examination at the end of study. After completing SSLC, students will have to complete the 2 years Pre-University Course (PUC) course which will bring an end to the twelve-year period of study. Later he/she can choose for undergraduate studies in a university or pursue a shorter diploma course in an industrial training institute acquiring skills necessary for technical occupations. Another option is joining polytechnic for a three-year course of diploma in engineering. As the performance in the SSLC examination is the key factor in obtaining admission to HSS, students give much importance is given to the course. Kerala SSLC Exam Results 2011 will be published on 28th April 2011. So many students are waiting for the announcement of the results. The Kerala Government will put the results in the website of IT@school immediately after the announcement of the results. 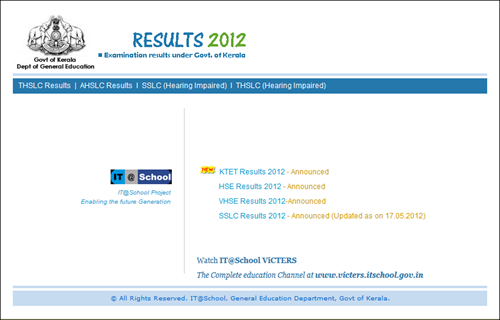 Here we provide you the instructions to download Kerala SSLC Results 2011 from ITschool Website. With these instructions you can easily check your results in no time. SSLC Results 2011 will be out on 28th April 2011. The following websites or links contain will give your SSLC Results.